You know the story well. The Prodigal Son takes his inheritance, goes to a far-off land and wastes it all on riotous living. Starving, he comes home, planning to ask his Father to forgive him and hire him as a servant but when his Father sees him on the road home (he must have watched for him every day) he runs to him and throws his arms around him, welcoming him home as his beloved son, as if he had never left. 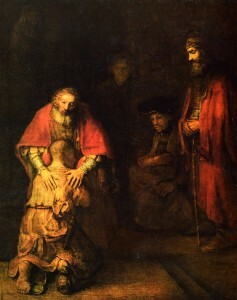 The older Son, hearing this, becomes very angry with the Father for his generosity but the Father tells him he is loved too but they must welcome back the Prodigal Son. That’s where Jesus stopped the story. The meaning is clear. God the Father loves us as sons, and is merciful to us when we sin and return. He desires that we (the older Sons) treat those who sin against us with the same mercy. After the welcome home party for the younger son, “everyday life” happened in that household. The Father had his two sons at home again but there was very likely a great deal of tension between them. The younger son had wasted his inheritance and likely felt guilty about that. How could he make amends to both his Father and brother? That would be a lifelong task, rebuilding the family’s wealth, half of which he had squandered. And the older son likely felt continuing resentment. You can imagine his smouldering anger. The Father had no way of forcing his sons to understand the implications of his great mercy and what it actually meant to both of them. In human terms, he had to “let them go” to find their own way through the situation which their internal feelings were creating. I think this story of everyday life is quite realistic. We may experience moments when we encounter God’s grace and mercy but then life goes on, and we experience our own interior life everyday. It’s too easy to say pray or meditate. The habits of our “false selves” continue to cover up the reality of our “true selves.” As St Paul said, speaking for all of us, “Why do I do the things I don’t want to do, and not do the things I really want to do?” Our life’s task is to handle this conflict and (gradually) come to realise what God’s mercy means for us, whether we are the Prodigal or Older Son. (Most like we are both). In my coaching and mentoring work I help my clients become familiar with three different aspects of their interior life — their thinking and acting self, their critical self, and their detached observer self. In everyday life all three are encountered. Much of our life is on ‘autopilot’ with our thinking and acting self in control and following well-known patterns. Occasionally, we become aware of a ‘voice’ critiquing what we are thinking and doing — “Why did you do that?” “That was a mistake you’ll regret” and so on. More rarely we experience a third part of ourselves, seemingly amused by the conflict between the other two parts of us — “That’s interesting. Every time I see a homeless person, I feel guilty and criticize myself” and so on. These three parts of ourselves can be seen in a different frame however: that of our “true” and “false” selves. Our false self develops during our life time out of our experiences, and adapts to the world in order to maximize our comfort and rewards. Peter Berger the well-known Sociologist wrote of this adaptation in his classic work The Social Construction of Reality. But why is this part of our self called a “false” self? This is a spiritual concept not a sociological or psychological concept. “Jesus, and most other great spiritual teachers make it very clear that there is a self that has to be found and one that has to be let go of or even ‘renounced. '” [from Richard Rohr Immortal Diamond] To be automatically in the thinking and doing self, even critiquing it from our critical self is to be caught in the world and adapting to its demands not God’s way. I believe that our detached observer self is the path toward experiencing our true self and God’s call. Let me explain. I said that my experience is my observer self is objective and amused by the conflicts between my other two selves. This means that the observer self is open to understanding what it is and how it ought to influence our life. If we are a believer, we sense that our true self looks to God as the source of wisdom about everyday living. Initially, we read and converse with others about God’s wisdom, and attempt to apply it in mediating the conflict between the other two selves in order to live out God’s wisdom. Then, gradually, we begin to see that we don’t have the power to live God’s wisdom by ourselves and we begin to take prayer seriously. At some point, we stop worrying about our ability to live according to God’s wisdom (such worrying is, after all, another manifestation of our critical self) and “let go and let God” carry us through life. I experienced this quite dramatically in my ‘conversion experience’ with God saying to me, “I love you just as you are.” I also experienced it again when I saw that I wasn’t climbing the mountain of God so much as being carried by Jesus (and my friends) up the mountain. That ‘true’ self is who we are when we realise that we are not so much making ourselves during life as being made by God. It is why we can feel peace in the midst of conflict, because we know God is in our center no matter what, resolving the difficulties of everyday living for our greatest good and his own purposes. Once we realise who our true self is we can exclaim with St Catherine of Genoa, “My deepest me is God!” What happens afterwards, after this realization, is a life lived differently, not perfectly, but a life lived in search of the deepest truth about our three selves. As Richard Rohr said, “Life is not a matter of creating a name for ourselves, but of uncovering the name we have always had.” That is what I think happened the next day after the Prodigal Son returned to the love of his Father. And to his older brother as well, once he forgave his younger brother. Previous PostPrevious Those guys are evil!